For the third year in a row, the Pawtucket Red Sox and the Rhode Island Blood Center are teaming up on September 11 to host a "Day of Remembrance" Blood Drive in the Visiting Clubhouse at McCoy Stadium. The drive will take place from 1:00pm-7:00pm, and fans who donate blood will receive a $5 Dunkin' Donuts Gift Card and a PawSox Baseball Cap. 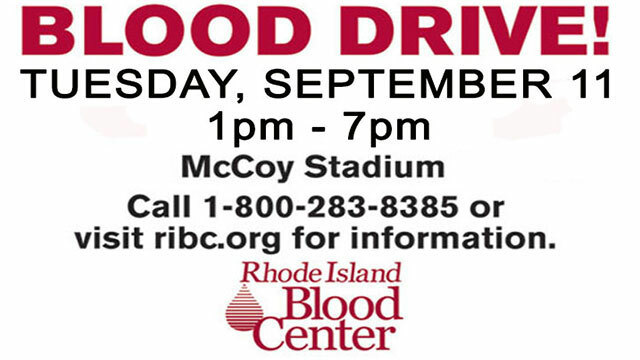 In the past two years at McCoy Stadium on 9/11, the PawSox have collected a record 128 units of blood for the Rhode Island Blood Center at McCoy Stadium. PawSox blood drives in past years had garnered less than a dozen units. "When America was attacked on 9-11, it affected us, unified us, and inspired us to do what we could to help," said PawSox President Dr. Charles A. Steinberg. "The PawSox commemorate this spirit with our annual 'Day of Remembrance' Blood Drive, when again, we come together as a community to do what we can--this time to save the lives of our friends and neighbors." There are over 370,000 people in Rhode Island who are eligible to donate blood, but only about 5% of the state's population donates on a regular basis. Over 200 units of blood are needed each day by the RIBC, which is where people in the PawSox Community can make a difference. Fans who donate blood will also be able to take photos on the field, and take a trip down the PawSox Hall of History.